Hip problems have several causes including aging, arthritis or fracture after a fall or accident. The pain can be a sign of future problems which may cause complications in your other hip or knee and spine joints. Medical treatment should be received sooner rather than later to prevent further problems and to resume your active lifestyle. How can I tell if I need my hip joint replaced? To determine if hip replacement surgery is necessary, a specialist will examine your joint and take x-rays or other tests. Constant pain and reduced mobility including difficulty in walking or climbing stairs are typical danger signs. Preliminary steps to treat hip problems include walking aids (braces and canes), physical therapy, exercise routines and medication to ease arthritis or reduce pain. If these measures are unable to control or dissipate the pain, surgery is the long-term solution. What is a new hip joint like? A new joint, called a total hip prosthesis (THP) can be made of plastic, metal, ceramic or a combination such as ceramic-ceramic, metal-metal or metal-plastic. It may or not be cemented into place, your bone growing into it. Both methods may be combined to keep the new joint in place. The material used depends on patient age and what surgeons recommend. A cemented joint is most often used in older patients, who do not move as much and for people with “weak” bones. An uncemented joint is recommended for younger, more active patients and those with good bone quality. These patients can handle better the longer healing process necessary for bones to grow and attach to the new joint. New joints generally last a minimum of fifteen years. Therefore, younger patients may need to have the same damaged joint replaced more than once. Do many people have their joints replaced? Joint replacement is fast becoming a common procedure to improve the lives of these with joint problems. Annually in America alone, 435,000 patients have their hips and knees replaced. Research has shown that joint replacement surgery is effective and increases mobility, no matter at what age. The orthopaedic surgeon will carefully replace the damaged joint with prosthesis. What kind of anaesthesia will be needed? Anaesthesia is administered to block pain either in one part of the body (regional) or throughout the whole body (general). The length depends on the patient, how badly the joint is damaged and the method adopted, but should generally not take more than two hours. Pain can be expected, medication being prescribed. A few weeks or months may be required until the body is fully healed, the muscles have strengthened and the pain disappears. Following surgery, you will be moved to a recovery room for one to two hours until you are awake or the numbness dissipates. Within twenty-four hours, you should be able to walk with the assistance of crutches and begin physiotherapy. A detailed rehabilitation programme will be explained to you by our physical therapist, including performing daily exercises to recover the range of motion and strengthen weakened muscles. A minimum of eight nights in hospital are required. Any additional time in the hospital is a matter for discussion between you and your team of doctors. Elderly patients and those with other problems can expect to spend a few more nights before being discharged. All patients are advised to refrain from flying for three weeks after surgery as extended periods of sitting can lead to thrombosis. On return home, it is very important to follow your surgeon's advice on diet, medication and exercise to ensure that your surgery is a success. While 90 per cent of joint replacement surgeries are considered successful, some patients may experience complications. In the event of pain or mobility issues, talk to your doctors. Transfer from FV Hospital to Thao Dien Village (www.thaodienvillage.com). 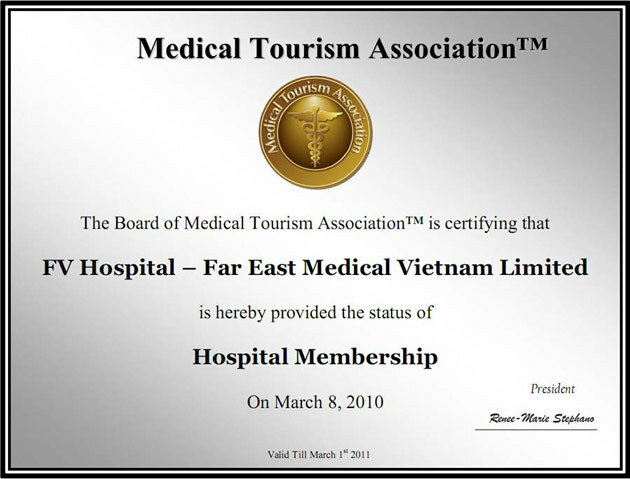 FV hospital for post-discharge consultation (after recommended days by doctor).